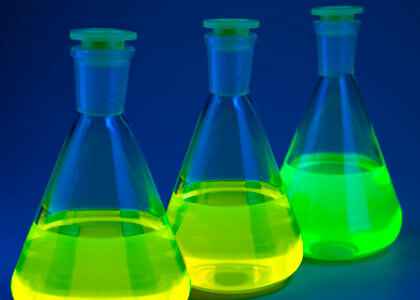 Also known as Fluorescent Whitening Agents (FWA’s) or Optical Brightening Agents (OBA’s): They are organic compound used to enhance the visual brightness of a substrate. They absorb the light in the ultraviolet range of the spectrum(under 370 nm) and re-emit this light in the visible range(435 nm) giving a fluorescent effect that produce better brightness and whiteness. Among their main applications are paper, cotton, acrylic, plastics and detergents.